I have very acne prone skin, so I am always looking for new soaps and products that help with acne. Recently, I was lucky enough to receive a bar of soap through Tomoson.com that is made with sulfur which is an antiseptic, anti-fungal and antibacterial. It works really well on my skin! It leaves my skin with a very clean and refreshed feeling and squeaky clean! This soap is meant for those with acne prone or oily skin so I would not recommend it to others. My skin is sort of combination skin though, and it did not dry my skin out at all, as long as I used my regular moisturizers. Within a week of using, I did notice a lessening of acne on my face. 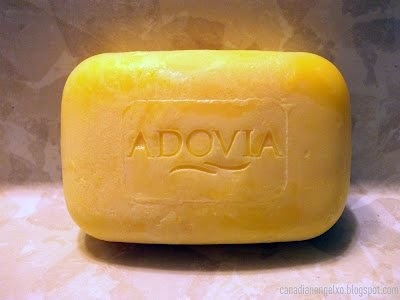 "Adovia sulfur soap, is highly enriched with minerals and sulfur from the Dead Sea.Your skin's natural moisture levels are balanced and optimized with Olive Oil, Dead Sea minerals and Aloe Vera extract. Sulfur has Antiseptic, Anti-Fungal and Antibacterial properties.This soap thoroughly cleanses your face and body and leaves your skin gentle and smooth Our sulfur soap has a 3% sulfur content." Este jabon se ve perfecto para mi sobrina que sufre de acne severo. Gracias por tan buena informacion.